These Strawberry Crumb Bars have a buttery shortbread base, a layer of fresh juicy strawberries & are topped with a delicious streusel. So easy & so tasty! I love springtime because fresh fruit comes into season and immediately there’s about 100X more baking options. Blueberry pancakes, raspberry cake, berry muffins…. Your kitchen table looks so pretty from baked goods dotted with pink, red & blue fruit, and you can seriously up the flavor by just going from frozen to fresh berries. Clearly, the kitchen gods are smiling down at us. So after buying 3 lbs of butter and a carton of strawberries – it’s time to get baking. Today’s menu: Strawberry Crumb Bars. These bars have a buttery, shortbread base; a layer of fresh, juicy strawberries; and are then covered in crumbly, buttery streusel topping. They’re the type of bars that are perfect with a cup of coffee in the afternoon, or a scoop of ice cream for an easy summer dessert. And since the ingredients are likely things already in your kitchen – they’re a simple dessert with little effort needed. The base is made with just butter, flour, a little sugar & some cornstarch. It’s shortbread-esque, and perfectly firm to support the thick layer of berries. For the strawberry layer we’ll simply chop up our berries, then toss in a little cornstarch and sugar to help thicken the mixture. I added a little orange zest to mine for extra flavor – which is quite divine to say the least. Then for the streusel topping. I may have gone a bit overboard with the amount – but no one complained. The streusel has large crumbles with a nice crunch, and the delicate butter flavor pairs so well with the strawberries. Now – your cook time here will vary depending on if you used fresh or frozen berries, but either option works just fine. After baking, you’ll need to wait til they’re completely cooled before cutting into the bars. If you chill them in the fridge, they’ll cut even easier. I love these bars for spring & summertime. They’re seriously easy to make – and the buttery, crumbly, streusel deliciousness is perfect with the fresh strawberries. And since you can never have too many easy summertime desserts – these should definitely be added to your kitchen to-do list. 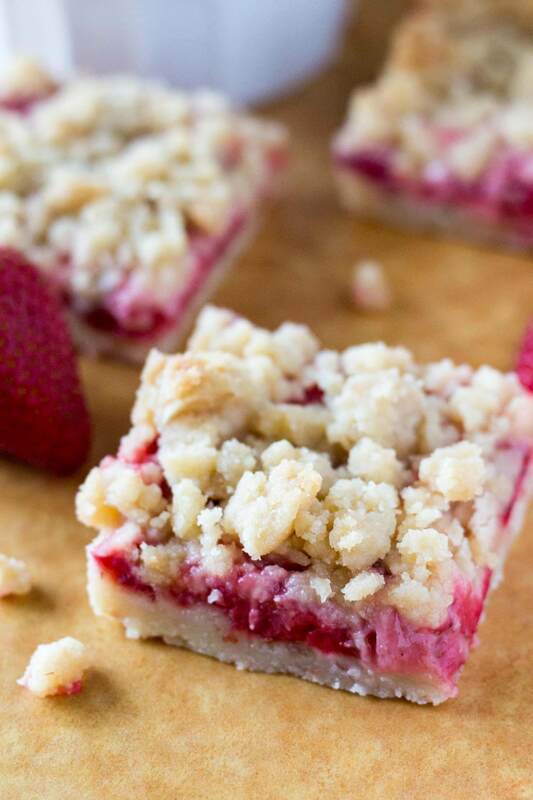 These Strawberry Crumb Bars have a buttery shortbread base, a layer of fresh juicy strawberries & are topped with a delicious streusel topping. So easy & so tasty! Preheat the oven to 300F degrees. Line an 8x8 inch square baking pan with aluminium foil, leaving an overhang on each side. Grease with butter or non-stick cooking spray. To make the base: In a large bowl using an electric mixer on medium speed, beat together the butter and sugar until well combined. Turn the mixer down to low and beat in the flour and cornstarch until combined. The mixture will be crumbly. Press the mixture firmly into the bottom of the prepared pan. Bake for 15 minutes. While the bottom layer is baking, make the strawberry layer and topping. To make the strawberry layer: Toss together all the ingredients (strawberries, cornstarch, sugar & orange zest) in a medium sized bowl. Set aside. To make the streusel topping: In a medium bowl stir together all the ingredients using a large wooden spoon or rubber spatula. It will be crumbly. After the bottom layer is done baking, remove it from the oven and turn up the oven to 350F degrees. Carefully spoon the strawberry mixture over the shortbread base until it's evenly covered. Then crumble the streusel layer over the strawberry layer. If you make a fist around the streusel and release your hand - it should form crumbles. Bake for 30-35 minutes until the streusel topping begins to turn golden brown and you can see the strawberry layer bubbling underneath. Amazing. Yes. I need these in my life right now. Love love love the freshness and easiness and I cannot wait to try these out! YUM is all I can say Fiona! These look absolutely AMAZING! These are so happening in my house this weekend! Thanks Tez! Let me know what you think of the recipe – I hope you love them! Soon will be strawberry season again so I’ll be baking these again. They were a great success the last time. My kids are strawberry bar addicts and they LOVE this recipe! I don’t use the regular sugar for the top but it is still tasty! Thank you for this recipe! We’ll keep coming back to it! I made them and they were amazing! The orange zest is essential! Was wondering if I could make them with Morello cherries and how much cornstarch I would need? I haven’t tried, so I’m not sure of the results. I do have a separate recipe for cherry bars using sweet cherries that you could try here: https://www.justsotasty.com/cherry-almond-bars/ I’m guessing if you used sour cherries you’d want to increase the sugar, and for 2 cups of cherries you’d probably want about the same amount of cornstarch.